Singapore is not the first place that comes to mind when people think of the space industry. But an increasing number of spacetech startups are planting its flag there – from companies building low-cost rockets to tech teams innovating in telecommunications, blockchain tech, and more. Government support is growing and foreign companies are also setting up shop in the island nation to take advantage of the impending groundswell. As a new industry, however, it faces challenges. Talent can be hard to find, and cautious investors hesitate to back space startups because they take longer to build a functioning product compared to software companies. But the opportunity seems to be there. 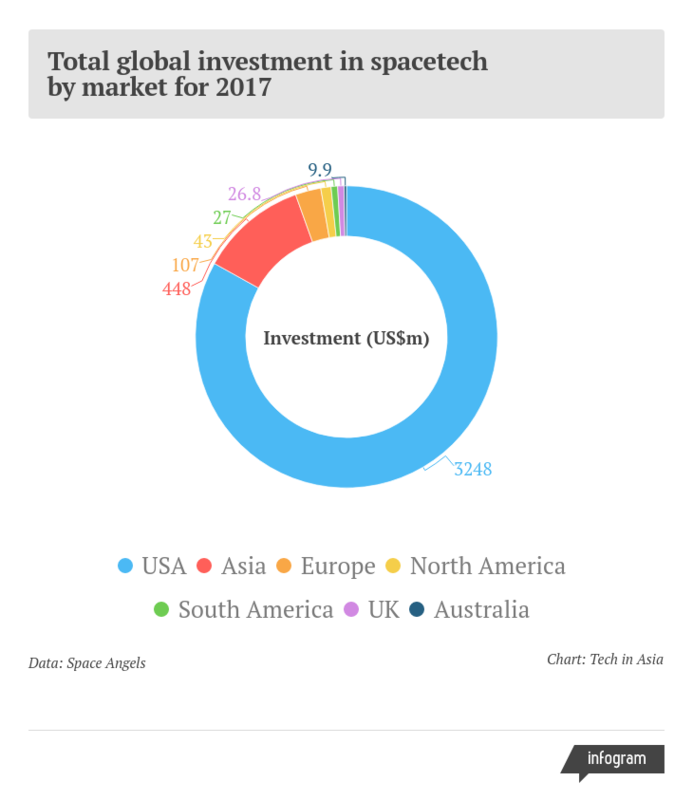 Morgan Stanley values the global space industry at US$350 billion and predicts this figure will skyrocket US$1.1 trillion by 2040. This growth is partly driven by large private space ventures like Elon Musk’s SpaceX and Jeff Bezos’ Blue Origin. But it also has to do with the ever-lowerbarriers to entry for entrepreneurs building technology like satellites and drones. Dropping component costs, easier access to manufacturing and a market that promises a wealth of use cases and applications are attracting more founders and investors. Dr. Bidushi Bhattacharya, a former NASA rocket scientist, has established Bhattacharya Space Enterprises (BSE) in Singapore. The company is fostering a spacetech ecosystem through science projects, training workshops, and community building. She also started Astropreneurs Hub, an incubator aiming to help spacetech startups get off the ground and launch their prototypes – something that should make them more attractive to investors. “I think VCs will be much more comfortable coming in when you have flight heritage,” she explains. The investment community in the Asia Pacific lacks a lot of space experience but it’s getting better. Bhattacharya arrived in Singapore in 2014 after two decades of working in the aerospace industry and has been instrumental in growing the local market. “2018 is a very different picture than even a year ago,” she tells Tech in Asia. For one, the Singapore government is a lot more enthusiastic about the sector. Local and foreign companies are getting support from the Economic Development Board and SPRING Singapore, while SGInnovate invests in deep-tech startups and frequently organizes spacetech-related events that draw in founders and investors. Venture capital firms are also taking notice. For instance, 500 Startups has backed rocket builder Gilmour Space Technologies (GST). Space debris startup Astroscale has raised US$53 million in total from investors including Taizo Son’s Mistletoe. “I had to walk [our investors] through the technology, our business plan, our customer market,” GST founder and CEO Adam Gilmour says. Gilmour is developing a proprietary hybrid fuel to power rockets that can transport small satellites in orbit cheaply and efficiently. Its first suborbital rocket is slated to launch in 2019. “Once we got our message across, it was worth the effort. The investment community in the Asia Pacific lacks a lot of space experience and is gun-shy, but it’s getting better,” he adds. At the Space Startup Night event last week, 500 Startups partner Vishal Harnal said that when the VC firm first started investing in Southeast Asia, people were as hesitant about the emerging startup ecosystem as they are now about spacetech. But the same factors that spurred the growth of Singapore’s startup sector to apply to space ventures as well, such as lower barriers to entry, government policies that encourage research and development, and an influx of foreign talent. UK-based Seraphim Capital claims to be the first VC firm in the world to focus on spacetech. With a new US$250 million fund expected to close later this year, Seraphim wants to invest in startups globally and is looking to expand its operations to Asia as well. “There’s no shortage of capital, just shortage of expertise, of understanding the market,” Seraphim CEO Mark Boggett tells Tech in Asia. Along with Japan and others, Singapore is one of the countries that the firm is considering for its Asian presence. What could tip the scales in the city-state’s favor is local interest in the spacetech industry and its well-known friendliness to business. Tytus Michalski, co-founder and managing partner of Hong Kong-based Fresco Capital, thinks the current opportunity in spacetech resembles the early internet, where some companies developed infrastructure (such as servers and connectivity) while others worked on applications. The VC firm is an investor in US satellite and data company Spire, which has a presence in Singapore. Michalski believes it can be one of those space infrastructure players. Spacetech may sound exotic, but when viewed through an investor’s lens, it’s not much different than most other deep-tech startups. This is good news – it means that investors shouldn’t be afraid of the sector any more than they should be of AI or healthcare. Oftentimes, people hear “space” and imagine Elon Musk shooting a Tesla to Mars or tourist round trips to the Moon. But its actual appeal is at once more mundane and exciting than those scenarios. As Boggett points out, “Space data plays into intelligent transport, smart cities, IoT, and so on.” This is data gathered by satellites and other spacecraft in orbit, which previously only governments and large corporates had access to. “People get a lot more comfortable when you replace the word ‘space’ with ‘IoT’ or ‘intelligent transport’,” he quips. Singapore-based Transcelestial embodies this combination of a far-reaching vision and a down-to-earth approach. An alum of Entrepreneur First’s inaugural Singapore cohort, the startup is developing a laser-based, high-bandwidth system for transmitting data across large distances – whether we’re talking about different cities or different star systems. It promises to speed up and increase the bandwidth of wireless data transmissions. More spacetech firms, both foreign and domestic, are using the developing ecosystem as an opportunity to call the island nation “home.” Equatorial is another startup building rockets, aiming for an even smaller niche than Gilmour. The company is trying to build rockets that carry payloads of up to 40 kg – nanosatellites that need to be deployed in large clusters through multiple launches. “Think of us as the Learjet of launchers,” says Equatorial founder and CEO Simon Gwozdz. Spacechain has its own ambitious plan: an open-source network on a satellite constellation to power blockchain-related applications, without the need to rely on platforms like Google and Amazon for their backend. CEO Zheng Zuo thinks it’s not possible to achieve true decentralized infrastructure as long as companies depend on providers like AWS. The Singaporean startup recently launched its first satellite, containing Raspberry Pi hardware that houses the Qtum Foundation’s blockchain tech. And US-based Audacy provides real-time communications services to low-Earth orbit satellite operators and spacecraft operators. The company is currently building a new ground station in Singapore and boosting its local presence through new hires. All these players and activity are overseen by the decade-old Singapore Space and Technology Association (SSTA), which organizes the annual Global Space and Technology Convention (GSTC). This year, president Jonathan Hung announced a new accelerator for spacetech startups. Astropreneurs here are starting to get together – and that’s exactly what you want to see. On the sidelines of the GSTC, Hung told Tech in Asia that the accelerator is designed to fill a gap, as there are no complete solutions for Asian entrepreneurs who want to get into the private space industry. The program will start accepting applications from local and foreign ventures in August 2018. Through this initiative, the SSTA hopes to help startups scale and find markets by connecting them with its industry partners. It also wants to support their efforts to collaborate with manufacturers and pull in investors. As with other startup sectors, community building is important, and BSE’s Bhattacharya is optimistic about the local scene. “What I like is that astropreneurs here are starting to get together, ideate and socialize outside our official meetings – and that’s exactly what you want to see. I want this whole ecosystem to exist whether I’m here or not, and I think we’re just about there,” she says. "With a new US$250 million fund expected to close later this year, we're investing into startups globally and looking to expand operations to Asia as well"